It seems to have been raining for an eternity. But today? As I went on the school run I noticed a slight change...something turned up that I hadn't seen in a long while. THE SUN! Yes the sun was out and there is nothing finer than the potential of a season change as it means? I get to buy all new things! For those who don't follow me on instagram, every day I post what I am wearing. Sometimes I look lovely? Sometimes I look a hot mess but it's to show what real Mums are like. So today here are a few pieces I would LOVE to wear in the coming months. Even though the sun is out it will still be freezing at 8:30am for a few months yet so these tops (1) from Monki are ideal to shove on in the morning. I adore the floral print over the sweatshirt and the hoodie is oversized basically makes it a fancy dressing gown. The flannel dress is as close to a nightie as humanly possible and would look great with either the tall Top Shop black leggings (2) or the blue New Look jeggings (3). Spring means? You can wear sunglasses without looking a bit of a diva. This year we are going on a few posh holidays as I have a rather big birthday coming up. I know 21? Can you believe. Cough. So I am going to invest in one of these two pairs of Ray Bans from SmartBuyGlasses UK (4). On the site you can work out which will fit your face best so I will have a go on that before I purchase. I LOVE a scarf and this Flo one (5) from Monki is currently in the sale for £8. 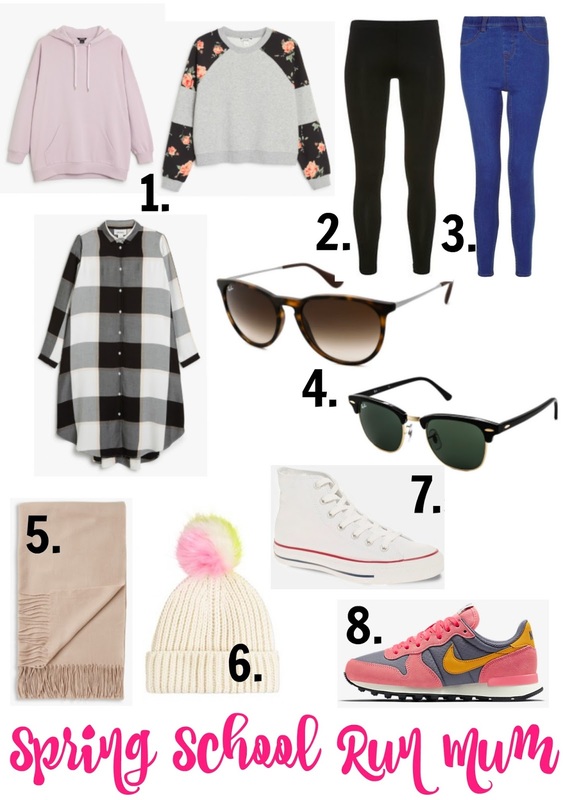 I think the soft pink paired with the pastel pom pom on this Topshop hat (6) is perfect for crisp mornings. I recently cashed in some ASOS points and got myself some All Start Hi Converse (7). If you buy from ASOS regularly it's really worth checking your dashboard to see if you are owed any. They can be put towards any purchases which is great. I then thought I would pop onto the Nike site and have a little look around. I basically? Found my dream trainers in this Internationalist style (8). I can't wait for payday at the end of the week so I can rush out and get them. So this is what I hopefully will be wearing on the school run in the next few months. Let's just pray the rain keeps away!